The Titan Arum is considered by many to be the plant that produces the world's largest flower. Unfortunately looks are deceiving as this particular 'flower' is technically a flowering organ which acts as a sheath. This sheath surrounds a spike which produces clusters of many smaller flowers at its base. 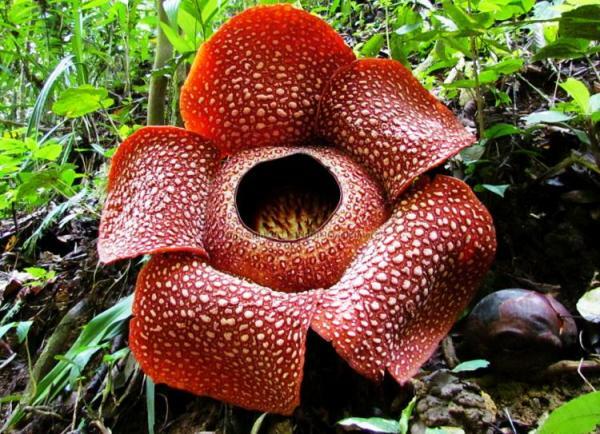 So if you want to be pedantic about things, and you should in this case, the largest 'true' flower is not the Titan arum, but is in fact the incredible Rafflesia arnoldii. Like the Titan arum, it is noted for producing the largest individual flower on earth, and for producing a strong odour of decaying flesh, hence its common name of 'corpse flower'. It only occurs only in the rainforests of Bengkulu, Sumatra Island, Indonesia, and Malaysia, and is already near extinction due to loss of habitat. The Rafflesia arnoldii plant is rare and difficult to locate. This is compounded because the buds take many months to develop and then flower lasts for just a few days. The flowers are unisexual and therefore the close proximity of male and female flowers is vital for successful pollination. Combined, these factors make successful pollination a rare event. When Rafflesia is ready to reproduce, a tiny bud forms on the outside of the root or stem and will develop to maturity over a period of a year. The cabbage like head that develops will eventually opens to reveal the flower. The stigma or stamen are attached to a spiked disk inside the flower. 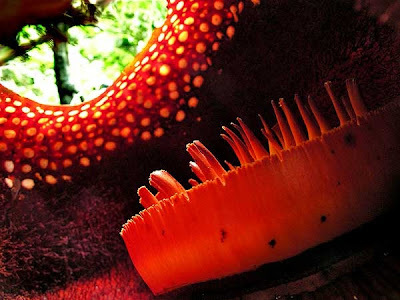 A foul smell of rotting meat attracts flies and beetles which the Rafflesia needs for pollination. However, to pollinate successfully, the flies and/or beetles must visit both the male and female plants. 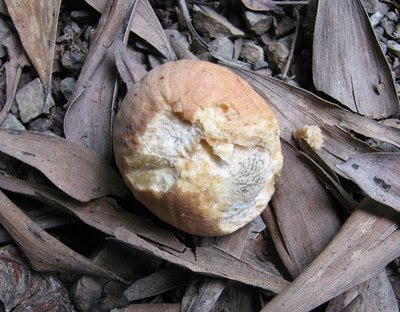 The fruit produced are rounded, and filled with smooth flesh including many thousands of hard coated seeds that are eaten and spread by tree shrews. It lives as a parasite on the Tetrastigma vine, which grows only in undisturbed rainforests. Rafflesia lacks any observable leaves, stems or even roots, yet is still considered a vascular plant. Similar to fungi, individuals grow as thread-like strands of tissue completely embedded within and in intimate contact with surrounding host cells from which nutrients and water are obtained. How many of these plants still survive is unknown, but as the remaining primary forests of Borneo and Sumatra disappear it can be assumed that their numbers are dwindling. Many individuals are known to be nearing extinction, so environmentalists are attempting to develop ways to recreate the species environment in an effort to stimulate their recovery. This has proved unsuccessful so far. Steps are also being taken to conserve the forests of Sumatra and Borneo. To help counter the over-collection of this rare plant residents that have Rafflesia on their private property are encouraged to save the flowers and charge a small fee to see them.